More than two-thirds of states responded to a nationwide survey on elections data conducted by the National States Geographic Information Council (NSGIC) in the first half of 2018. Responses were coordinated by state government representatives who focus on the development and deployment of mapping data and systems across state agencies and local governments. 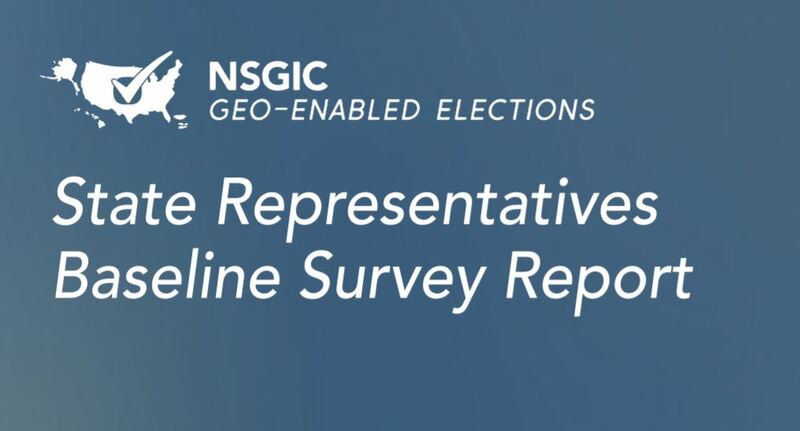 “An electoral system with integrity – enhanced by accurate, authoritative geographic data and presented clearly and transparently – has never been more important,” said NSGIC President Andy Rowan. The National States Geographic Information Council (NSGIC) promotes the efficient development and management of location-based information resources, and advocates for innovative, strategic use of these assets to advance the interests of states, tribes, regions, local governments, and the nation. 55 percent of responding states confirm voter registration addresses against a database of known addresses such as a driver’s license or state ID database, a statewide point address set, a master address database used for 9-1-1 call routing, or a commercially available address database. More than half of responding states indicated they maintain statewide mapping of precincts. Within this group, 40 percent also maintain a layer of sub-precincts in digital mapping systems. 82 percent of states keep up-to-date spatial data of city and county boundaries, essential for computer-based mapping of precincts. A substantial majority, 79 percent of respondents, confirm their mapping of state-level district-based elected offices are accessible online in a digital mapping format. Later this year, NSGIC will release the results of a study probing the spatial approach to elections management from the perspective of state elections officials. The two-year Geo-Enabled Elections project, underwritten by the bipartisan Democracy Fund Voice, convenes a wide variety of stakeholders to explore ways geographic information systems and related processes can enhance elections management and citizen engagement across the US. Projects like these definitely put the “geek” in electiongeek, but the end results include accurate online boundaries for election geography, the ability to locate addresses as points on a map as opposed to properties on on street segments and greater interoperability with other geographic data. This not only improves the accuracy of the election map (no small thing in the wake of stories about mis-assigned voters in close elections) but also creates endless opportunities for innovation. Kudos to NSGIC for this work and to Democracy Fund Voice for supporting it – and. as always, thanks to electionlineWeekly and Mindy for sharing it with the field. I look forward to hearing more about the Geo-Enabled Elections Project! Be the first to comment on "electionlineWeekly on New NSGIC Elections Mapping Report"